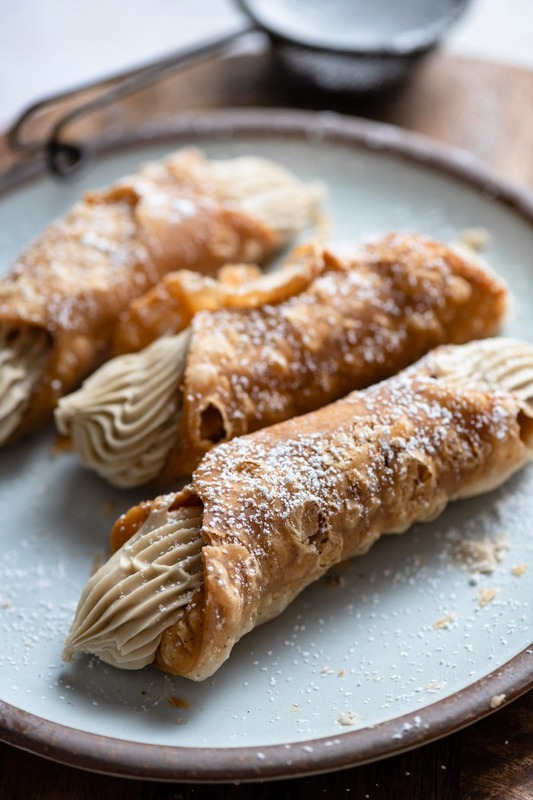 Cannoli is a delightful Italian dessert that ticks all the texture boxes. 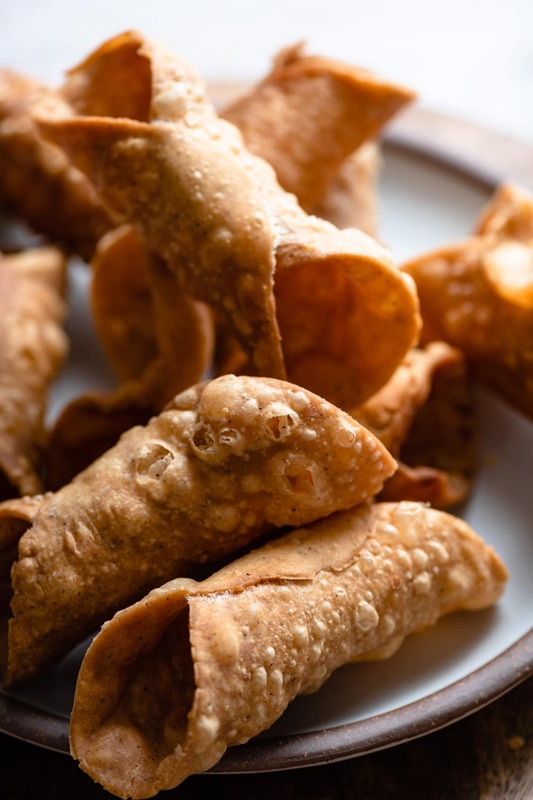 Crunchy shells with a rich creamy filling just screams decadence. For this recipe I took a slight detour from tradition and did away with ricotta cheese. Gasp!! What a rebel is what you’re thinking right?! I really wanted the flavor of the sunflower butter to stand out, so I took creative liberty to make my own filling. I used mascarpone cheese instead of ricotta, but you can also do without cheese altogether and use just creamy SunButter. Sunflower Butter is made from sunflowers seeds with a wonderful texture and flavor similar to peanut butter. It is also a great substitute for those peanut butter lovers with allergies. I chose sunflower butter by SunButter for the sheer deliciousness it gives this cannoli filling. Seriously can’t get enough of it. Maybe I should use it to fill doughnuts next?! Cannoli is an Italian pastry in the shape of a hard tubular shell filled with a sweetened creamy ricotta cheese. They can be dipped in chocolate, sprinkled with nuts, and dusted with powdered sugar. 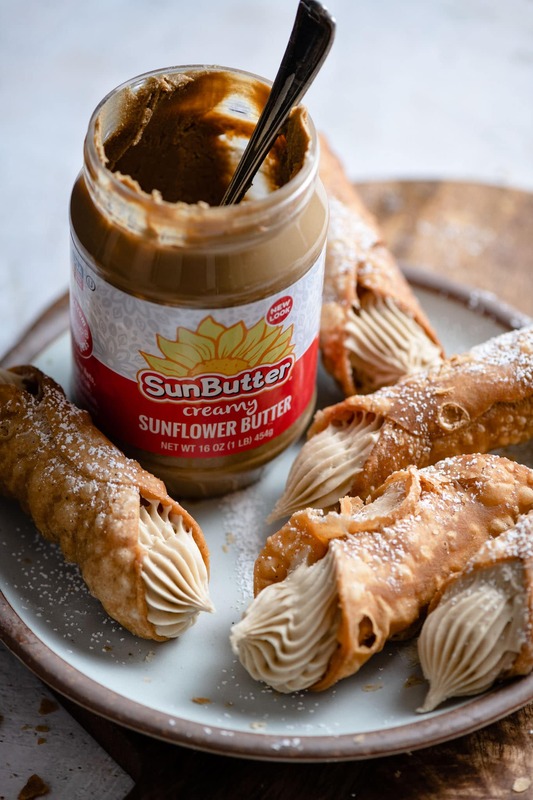 I chose to use SunButter creamy Sunflower Butter because of its quality, taste, and health benefits. This post is Sponsored by SunButter. Thank you for supporting everything Two Cups Flour! Prepare your dough by hand for best texture. Use a dry white wine in your dough. Chill your dough for an hour before rolling out. Use a 4 inch round pastry or biscuit cutter. Thin dough is best for making shells. Rolling out by hand can work, but I suggest using a pasta roller. I send my dough through the roller once at the the thickest setting, then one time each through the next two tighter settings. Dough should be at least 1/8 inch thick, if not a tiny bit thinner. 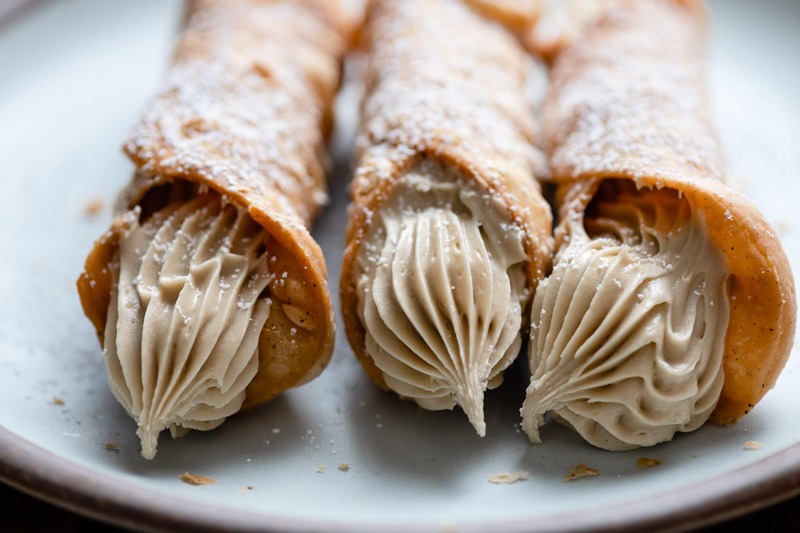 Cannoli shells should have a textured bubble appearance. If your shells are smooth, chances are they’re too thick. Cook your shells in Sunflower Oil for a light, non greasy flavor. If you don’t have sunflower oil, vegetable oil will work. Use an oil safe thermometer to check temperature of oil before frying your dough. Once oil has reached 350-375 F (180 C), it is hot enough to fry. If your oil is too hot, the dough will cook quickly. This results in a shell separating from the tube and/or burning. Use tongs to lower your uncooked shells into the oil and for removing cooked shells. Be very careful when frying with hot oil. Bubbling oil may spit, so keep your hair and face away from pot. Shells are done cooking when they reach a light golden brown color. Usually in 2-3 minutes. Place shells onto a paper towel lined cookie sheet to absorb excess oil while cooling. Once cooled, gently push tube out of your shell. Use Creamy or Crunchy SunButter for your base. Make sure your mascarpone is room temperature. If you don’t like mascarpone, substitute it with another half cup of Sunbutter! Vanilla Almond Milk can be substituted for regular milk. Add powdered sugar slowly while mixing your filling. If your filling is too thick, simply add Almond Milk a Tbsp at a time while mixing until desired thickness. If your filling is too thin, pour additional powdered sugar into mixture until desired thickness is reached. Use a piping bag with desired large decorating tip or simply cut the end of your piping bag for a smooth piping design. Cooked shells can stay fresh in an airtight container for up to 30 days. Filled Cannoli will stay fresh in the fridge for 2-3 days in an airtight container. 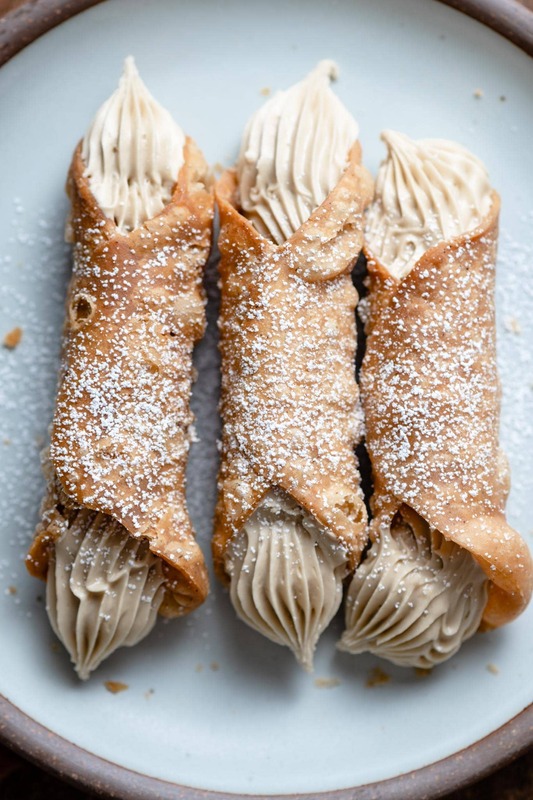 Homemade Cannoli filled with creamy Sunflower Butter. 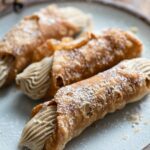 Mascarpone and Sunflower Butter filling inside a homemade cannoli shell. Whisk together flour, salt, nutmeg, and cinnamon in medium bowl. Add chunks of butter and mix together with hands until resembles cornmeal. Stir in egg with wooden spoon. Pour white whine onto the mixture and work together with hands until forms a smooth dough. Form into a large ball, cover with plastic wrap and place in the fridge. In the bowl of a stand mixer whisk together mascarpone, Sunbutter, and almond milk until creamy. Slowly add the powdered sugar while continuing to mix on medium speed. Place bowl of filling in the fridge for 30 minutes. 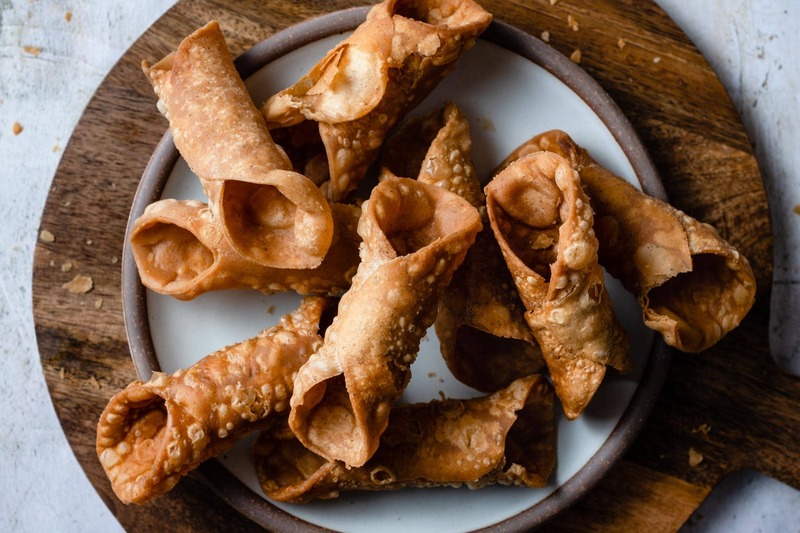 Prepare your cannoli frying station. Fill a medium pot 3/4 full with sunflower oil and heat to 360 degrees. Lightly sprinkle working surface with flour. Remove dough from fridge and cut in half. Roll each half into a very thin 1/8 inch rectangular oval. You can also pass your dough through a pasta roller, using the first two thickness settings. Take your 4 inch cutter and cut out rounds. Take excess dough reform into ball and cut more circles. You should end up with about 20 dough rounds. Gently shape each round into a longer oval, being careful not to teat them. Wrap around the cannoli mold lengthwise. Brush a small amount of egg white onto the edged that meet to seal them together. Cook 2-3 minutes until crispy and light golden brown. Place cooked shells on a paper towel lines cookie sheet to cool and drain excess oil. Once the shells are cooled, gently grip the mold with your fingers and slide the shells off. Transfer filling to a large piping bag. You can choose to you a decorative tip or simply cut the end of your plastic piping bag and pipe with no tip. Starting from one end fill until Sunbutter cream runs out the end. Flip cannoli around and fill other side. 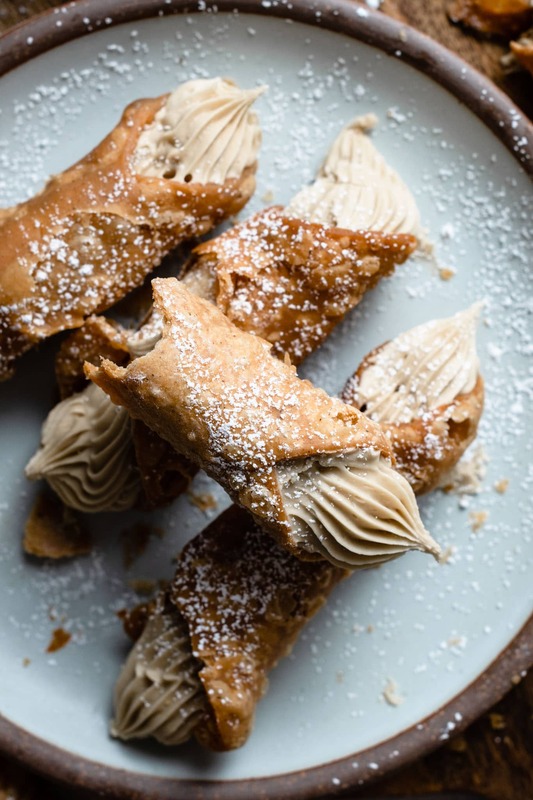 Dust the tops of your cannolis with powdered sugar. Serve immediately or store in air tight container in the fridge.